Read what other professionals are saying about the program. “Dr. 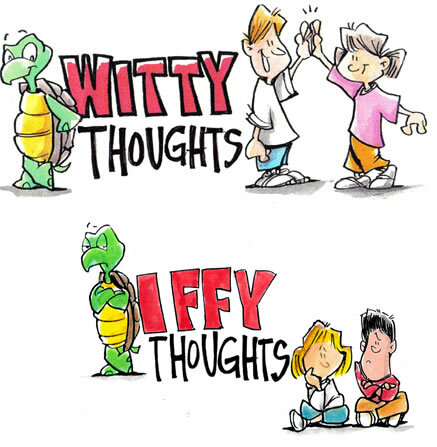 Teresa Busto and Paula Busto’s On Second Thought From Iffy to Witty Thoughts is an essential tool for any professional teaching cognitive behavioral principles to children. It shows the cognitive process in a fun, creative, and interactive way. Important theories are taught through colorful pictures, interesting examples and stories allowing children to gain a true understanding of the concepts woven into the lessons. “The so commonly used concept of Cognitive Behavioral Principles; in revealing it’s complicated and cumbersome face in such a playful, colorful and “witty” way, is making it challenging for the facilitator although seemingly interesting and meaningful for the child. “Congratulations to Dr. Teresa Busto and Paula Busto for their new creative and highly innovative social emotional program adaptable to many age groups. This program is consistent with the CBT theory and practice of Dr.’s Ellis, Beck and Burns. The engaging graphics are both entertaining and informative and the program is suitable for individual, group, family and classroom applications.